Twenty years ago, the creation of the euro brought a major change to the international monetary system (Bénassy-Quéré et al. 1998). At the beginning, the ECB and the European Commission focused on building the necessary structures to ensure the smooth functioning of the ‘new born’ currency at home, in the euro area. Although Europe’s common currency instantly became the second-most important global currency upon its creation, the internationalisation of the euro was not a primary concern for policymakers at the time. The ECB and the Commission were therefore content to follow a policy to ‘neither hinder nor promote’ the internationalisation of the euro. Twenty years later, however, much has changed and it is time to revisit Europe’s traditional ‘benign neglect’ towards the international use of the euro. We argue that the balance between the benefits of having a widely used international currency and the costs that arise from the responsibilities involved has shifted in the direction of the former. On the cost side, some originally feared that a greater internationalisation of the euro would weaken Europe’s ‘monetary independence’. Two arguments supported this position: the first is a variant of the so-called ‘Triffin dilemma’, which posits that a dominant global currency necessarily entails a large current account deficit; the second is based on the loss of control of monetary aggregates when a currency is widely used by non-residents. If the validity of the Triffin dilemma is today a subject of debate, the tension between short-term domestic priorities and longer-term global interests remains valid, and so is the risk that global demand for safe assets remains dangerously unsatisfied or forces excessive US external debt. Independent monetary policy is about controlling the path of short-term interest rates, which in turn affects the domestic savings and investment balance as well as monetary developments. Higher foreign demand for euro-denominated assets would likely render monetary policy transmission more difficult as domestic investments would become easier to finance by foreign savings.1 Monetary aggregates would also increasingly reflect foreign demand for euro bills and bank deposits. The argument about monetary aggregates is, however, less relevant today than at the time of the launch of the euro. The ECB has, by now, accumulated longer-term experience with monetary analysis and has developed a broad set of tools and instruments to conduct such analysis. These should allow it to extract from the monetary data relevant signals for longer-term inflation developments in the euro area even in the situation when the euro’s international role would be further expanded. Moreover, the way in which the international monetary system works has changed and thus the modalities through which the Triffin dilemma operates with the evolution of global governance towards a more multipolar system (Buti 2017). Bordo and McCauley (2017) consider, in particular, that the view that a currency’s reserve role requires current account deficits is flawed. This is because it assumes that “only US liabilities can provide US dollar reserves”, while in fact, “borrowers resident outside the United States widely use the dollar to denominate debts that are in turn largely held by non-resident creditors”. Moreover, this argument is empirically questionable. In fact, the current account position reflects other factors beyond the exchange rate, such as the fiscal position, demographics, net external liabilities, GDP per capita, financial development, or current account openness. In terms of benefits, greater international use of the euro would be positive for the euro area in two mutually reinforcing ways. First of all, it would strengthen ‘monetary sovereignty’ by making it possible for European companies to trade around the world, without the threat of extraterritorial actions by third-party jurisdictions to disrupt payments. Another valuable benefit would come from ‘scale effects’. Wider global use of the euro by, and between, third countries would improve the liquidity of, and preference for, euro assets. It would thus improve funding and trading costs for the euro area, and enhance the euro area’s resilience to financial shocks. A more liquid monetary system improves market efficiency and reduces transaction costs and risks of disruptions (Krugman 1984, ECB 2017). A larger and more robust monetary system should also be less vulnerable to country- or institution-specific shocks, as it reduces their relative significance. In addition, private agents also stand to benefit from lower exchange rate risk and lower hedging requirements, as they would be able to invoice and settle more trade-related payments in euros. Wider use of the euro would also imply lower funding costs in euros (‘exorbitant privilege’) for domestic private and public debt issuers (Gourinchas and Rey 2007). Moreover, domestic financing conditions in euros could become less dependent on global swings in risk sentiment. Fiscal revenues for the public sector (national central banks) would also arise from a broader use of Euronotes internationally (i.e. seigniorage). If there is an extensive economic literature on the benefits of scale effects, the importance of monetary sovereignty has only recently come to the forefront. This is because the economic and financial crisis has brought important changes to the global economy and governance. New technologies and economic powers have emerged. The world is more diversified, with some signs pointing to the emergence of a multipolar system of several currencies (Eichengreen et al. 2017). The dominance of the US dollar remains unchallenged, but China in particular has been very active in promoting the internationalisation of its currency.2 More recently, the US’ withdrawal from the Iran nuclear deal and its subsequent reinstatement of sanctions, together with increased strains in global governance and trade, have exposed global vulnerability to the US dollar’s international dominance. Thus, greater international use of the euro would also have benefits for the global economic system. In the first place, a credible alternative to the US dollar system would defeat the purpose of unilateral actions via dollar payment systems, as market operators would have other choices. On the economic side, the presence of a competitor currency would reduce monopolistic rents from global users of dollar-based payment systems, such as by correspondent banks, card payment providers, or reserve asset issuers. In sum, the first two decades of the euro have shown that there remains an untapped potential for the euro to play a stronger international role. The benefits of such a role are becoming clearer, while the original fears of losing control over monetary aggregates today appear overstated. The figures on the international use of the euro show that despite its young age, the currency is already an important international player. However, in a changing global context, policymakers can help strengthen Europe’s monetary sovereignty by giving the euro the means to play a larger role in the international arena with the support of market participants. The international role of the euro in figures: Untapped potential? The euro has been the second-most important world currency since its creation, despite the economic and financial crisis somewhat stalling its international progression. It is a currency that matters to the international monetary system and plays a crucial role in our neighbourhood. The robustness of the euro area together with trade and geo-political linkages has led about 60 countries to tie their currencies in one way or the other to the euro. The euro is used as a global means of exchange and store of value. The role of the euro as a global reserve currency has been broadly stable over the past 20 years at about 20%. This is one third of the US dollar’s rate, which has been losing ground since the 9/11 terrorist attacks. Other currencies, like the Japanese yen, the pound sterling or the Chinese renminbi, are very distant followers to the US dollar and the euro, with only a marginal use as reserve currencies. However, the role of other currencies, notably the Chinese renminbi, is rising as reserve holders diversify their portfolios to reflect, for example, China’s growing share of global GDP. Regarding debt issuance, by end 2017 about 20% of international debt issuance was denominated in euros, well below pre-crisis rates. Debt issuance in US dollars has followed the opposite path over the same period (Figure 1). Over recent years, the ECB established a number of currency swap lines with major central banks as a liquidity backstop to reassure banks in case of market impairments.3 Thus, the euro also plays an important role in safeguarding global financial stability. The euro’s role in international payments would seem at par with the US dollar (Graph 2), but the data is influenced by intra-EU payments. Moreover, despite its relatively wide use in international payments, less than 60% of the euro area’s exports outside the EU are actually invoiced in euros, in contrast with the US where about 90% of exports are invoiced in US dollars. Determinants of the global use of a currency: Where does the euro stand? The decision to use a particular currency is made by market participants, in the financial markets, by central banks and by exporters and importers of goods and services. The relative attractiveness of a currency depends on factors such as the size of its domestic economy; the credibility of its institutions; the presence of deep, liquid and free financial markets; well-functioning infrastructures for clearing and settling payments; as well as an established track record of economic and financial stability. The euro scores quite well on many of these criteria, a fact which is reflected in its relatively wide use abroad. However, there are factors that hinder its wider internationalisation. In particular, there is less liquidity in euros due to macroeconomic, institutional, and market-related factors. The euro is a young currency, the architecture of the Economic and Monetary Union is still incomplete, and there is only a limited pool of safe assets denominated in euros. Market factors relate to the dominance of US- and UK-based banks and exchanges, as well as underdeveloped payments systems that constrain the euro area’s monetary sovereignty. Thus, policymakers can influence the international appeal of the euro by strengthening its underlying economic fundamentals as well as its institutional framework and financial infrastructures. When market participants choose one currency over another, network effects play a crucial role. The more a currency is used, the more likely it is to be chosen by other market participants. Today the prevailing network effects still favour the US dollar in many cases. For example, in foreign exchange market transactions the euro plays a strong role on the continent but minor one in other world regions. 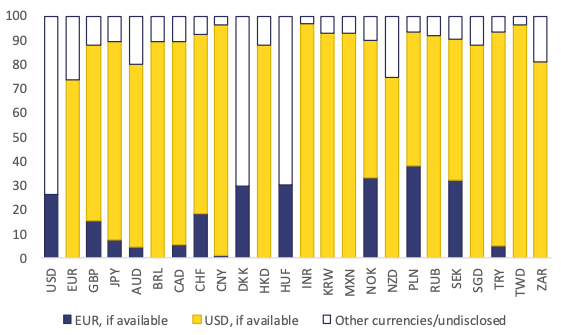 Outside of the EEA, almost all cross-currency transactions are settled in US dollars (Figure 3). For virtually every currency, bid-ask market spreads vis-à-vis the dollar are tighter than for the euro, reflecting liquidity. This is especially true in non-interbank trades, leading to persistent dollar ‘triangulations’ (i.e. conversion between two currencies by using the dollar as an intermediary). One practical reason may be the dominance of US- and UK-based banks in the foreign exchange market; as market-makers, they tend to favour the US dollar. These actors also dominate foreign loans in developing countries (in Africa, for example). Therefore, loans granted in local currencies are followed by large forex activity with the US dollar or the British pound in some cases. Another example concerns exports (Goldberg and Tille 2016, Gopinath and Stein 2018). A company in the euro area may decide to invoice in a currency other than the euro based on macro considerations, which are linked to the possibility of insuring and hedging against exchange rate movements. These financial products tend to be more easily available in US dollars, given the liquidity and depth of dollar-denominated financial instruments. Micro and strategic determinants relate to the demand elasticity and the competitive structure of the market, the size of the importers and the competitors, which may push European companies to use their currency instead of the euro. With no euro area-wide safe asset, the safe-haven status of US treasuries is a permanent feature that raises demand for the dollar, particularly during downturns when there are flight-to-safety capital flows. A temporary factor at present is related to the fact that today’s US monetary policy implies that dollar-denominated financial assets provide better returns. Finally, history/inertia also plays a significant role both at global and sectoral level (Krugman 1984). The prominence of the dollar is sustained by the central role that the US has played over decades in the global financial, trade and monetary system. At the sectoral level, trade in commodities is dominated by the US dollar despite the EU being the largest energy importer, with an annual energy import bill that averaged €300 billion in the last five years, around 85% paid in US dollars. But history is not static, Eichengreen et al. (2017) argue that changes in technology, trade and finance structures have a bearing on the international monetary system and that several international reserve currencies can coexist. The first 20 years of the euro has been a remarkable success story. Europe’s single currency has brought stable prices, lower transaction costs, more economic integration and competition to all its members. The institutional set-up of the euro area is unique compared to other currency unions, with a centralised monetary policy and decentralised economic and budgetary policies. This makes coordination of its Member States’ fiscal and economic policies crucial to ensuring the proper functioning of its monetary union. At the height of the economic and financial crisis, policymakers took decisive actions to strengthen the euro area’s architecture and policy coordination. Moreover, the ECB has acquired global renown for its conduct of monetary policy. The euro may be a young currency but it is mature enough to take a more decisive international stand to buttress monetary sovereignty. There is no silver bullet that would rapidly increase use of the euro abroad. This requires a comprehensive package of measures and time. The Commission proposed on 5 December 2018 a number of avenues to explore and develop together with market participants (European Commission 2018). Starting at the foundations by completing the Economic and Monetary Union should be a priority as it would cement the credibility of the euro area. The Banking Union, in particular finalising the backstop to the Single Resolution fund and the European Deposit Insurance Scheme (EDIS), would reinforce financial stability by further reducing the exposure of banks to their national sovereigns. A deepened Capital Markets Union would provide more diversified and liquid financial markets allowing for more private sector risk sharing. The euro would be more attractive internationally if there were a sufficient supply of euro-denominated safe assets, an important disadvantage today compared to the US. Safe assets allow an efficient functioning of financial systems and the development of capital markets, reducing financing costs for the economy. Euro-denominated safe assets would contribute towards the development of the European financial sector in general and the global relevance of European financial regulation, as well as EU-based payment systems. Several options for a euro area safe asset have been put forward with different design features (European Commission 2011), ranging from full to partial common issuance, some based on mutualisation and others entailing no joint liabilities, but there has been very limited political traction yet. Other measures aim to make it easier for market participants to use the euro by insulating against extraterritorial unilateral actions by third country jurisdictions. For instance, the Commission’s December Communication proposes to strengthen the liquidity and resilience of European market infrastructures, create a fully integrated instant payment system in the EU, and increase market liquidity for euro currency pairs other than euro/dollar. Other actions may have a smaller quantitative impact but are qualitatively important, such as encouraging European bodies to increase their share of debt denominated in euros or developing further Europe's economic diplomacy to promote the use of the euro in payments and as a reserve currency. Moreover, the Commission also proposes to provide technical assistance to facilitate developing countries’ access to the euro area payments system and, hence, support trade. Finally, in spite of their position as large buyers or major producers, European businesses still trade in US dollars in key strategic markets (energy, commodities, transport), often even between themselves. This exposes businesses to currency and political risks. Working with market operators is, in this case, essential to identify concrete actions that could be taken to foster the use of the euro. The euro area has full ‘monetary independence’, but ‘monetary sovereignty’ needs to be built on the basis of a reassessment of the benefits and costs attached to the international role of the euro. The world that we have known, characterised by the economic and technological superiority of western countries and the construction of a law-based multilateral order, is changing with the global relevance of China and competing approaches towards multilateralism. Europe cannot afford to remain on the side-lines if it wants to continue to shape the world according to its values and visions. This implies a larger role for Europe on the international scene, and the euro has a role to play too. The economic costs attached to an international role of the currency should be reassessed. On the one hand, fears about an outright appreciation of the euro with the corresponding deterioration of the current account should be evaluated against a broader assessment of the balance of payments. On the other hand, fears about losing control over monetary aggregates maybe overstated given the availability of new monetary policy tools. A greater global role for the euro implies greater global responsibilities. The ECB, for example, would need to consider the impact that its monetary policies could have on countries outside the euro area as well as within, as funding costs in these markets could become more dependent on financing conditions in the euro area (Gourinchas and Rey 2013, Farhi and Maggiori 2016). Moreover, Europe would have to be ready to provide insurance to the world during crises by ensuring a sufficient supply of its currency to the rest of the world. This ‘exorbitant duty’ is the corollary of the ‘exorbitant privilege’ of lower domestic funding costs that comes from having a domineering global currency (Gourinchas et al. 2010). Boosting the international role of the euro will take time and require a combination of measures, of different size and importance. One has to start with the foundations, by reinforcing the monetary union as well as by completing its construction. In this sense, some reforms are already under discussion, others have been proposed by the Commission and are being discussed by Member States. The latter have to be accompanied by more micro, specific reforms. These are necessary, as the use of the euro has many dimensions including diplomacy, improvements in payment systems and favouring the use of the euro in energy and commodities trades. Looking ahead, increasing market liquidity also through the provision of euro-denominated safe assets would be important. It is true that market participants choose the favoured currency for their trades. However, policymakers can influence the appeal of the euro through concrete actions to reinforce the euro area’s architecture and the depth and efficiency of the euro area’s financial markets. Authors’ note: The views expressed in this column are those of the authors and should not necessarily be seen as reflecting the position of their institution. Bénassy-Quéré, A, B Mojon, and A D Schor (1998), “The international role of the euro”, CEPII No. 03. Bordo, M and R N McCauley (2017), “Triffin: dilemma or myth?”, BIS Working Papers No. 684. Buti, M (2017), “The New Global Economic Governance: Can Europe Help Win the Peace?” in Reform of the International Monetary System and new global economic governance: how the EU may contribute, International Monetary Issues n°3, Robert Triffin International Association. European Commission (2018), “Towards a stronger international role of the euro”, COM(2018) 796 final. Farhi, E and M Maggiori (2016), “A model of the international monetary system”, Harvard University OpenScholar Working Paper No. 395921. Goldberg, L S and C Tille (2016), “Micro, macro and strategic forces in international trade invoicing: synthesis and novel patterns”, Journal of International Economics 102: 173-187. Gopinath, G and J Stein (2018), “Banking, trade, and the making of a dominant currency”, NBER Working Paper No. 24485. Gourinchas, P O and H Rey (2007), “International financial adjustment”, Journal of Political Economy 115(41): 665–703. Gourinchas, P O and H Rey (2013), “External adjustment, global imbalances, valuation effects”, NBER Working Paper No. 19240. Gourinchas, P O, N Govillot, and H Rey (2010), “Exorbitant privilege and exorbitant duty”, Institute for Monetary and Economic Studies (IMES), Bank of Japan Discussion Paper No. 2010-E-20. Krugman, P (1984), “The International Role of the Dollar: Theory and Prospect”, in J Bilson and R Marston (eds. ), Exchange Rate Theory and Practice, University of Chicago Press, 261-278. In February 2005, the US Fed Chairman Alan Greenspan pointed out that long-term interest rates had trended lower despite a 150 basis point increase in the federal funds rate and referred to this phenomenon as a “conundrum”. Allowing the use of the renmimbi for foreign trade settlement for Chinese firms, establishing a fully convertible offshore market, concluding more than 30 swap agreements between the People's Bank of China and other central banks including the ECB and, allowing authorised offshore institutional investors to access to the Chinese inter-bank bond market. In 2011 the ECB established currency swap lines with the Bank of England, the Bank of Canada, the Bank of Japan, the Federal Reserve and the Swiss National Bank, and in 2013 with China.